See marine life up close with chance encounters with dolphins, turtles, dugongs and maybe even whales in whale season! Once on the water on the Fraser Island Guided Jetski Safari, you are likely to see a variety of marine wildlife, including turtles, dolphins and possibly dugongs, on your way to your first stop at the award winning Kingfisher Bay Resort on the west coast of Fraser Island. From Kingfisher Bay Resort, you will travel along the visually stunning west coast of Fraser Island, until you arrive at Moon Point, where you will explore parts of the largest sand island in the world. You will then make your way through the pristine Great Sandy Strait on your return journey to Aquavue Cafe Watersports. 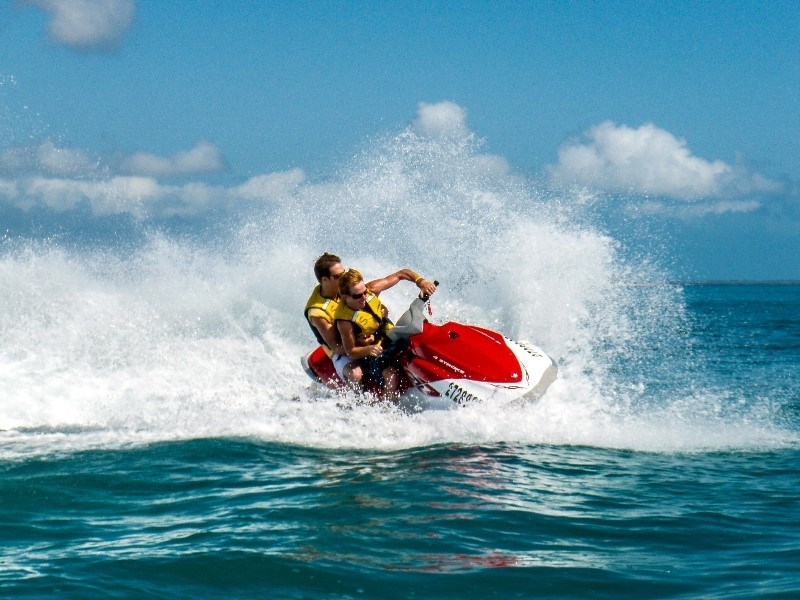 Your trip starts at Aquavue Cafe Watersports, located on the beach in Torquay, Hervey Bay, where you will be given a thorough safety briefing on how to operate one of our Jetskis. Once on the water, you are likely to see a variety of marine wildlife, including turtles, dolphins and possibly dugongs, on your way to your first stop at the award winning Kingfisher Bay Resort on the west coast of Fraser Island. From Kingfisher Bar Resort, you will travel along the visually stunning west coast of Fraser Island, until you arrive at Moon Point, where you will explore parts of the largest sand island in the world. You will then make your way through the pristine Great Sandy Strait on your return journey to Aquavue Cafe Watersports.